I had a booth at the Melbourne Art Festival in historic downtown Melbourne, Florida this past weekend. 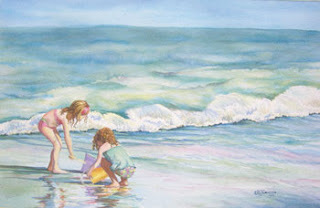 While at the show I worked on a few paintings and I was able to complete this one, which I have named Beach Play Two. I saw these little girls on the beach a few weeks ago and took some photos. I thought they were just so cute I had to paint them. I had a lot of fun adding colors to the wash of water on the sand.